Sand ceremonies, unity candles, and cord braiding are all symbolic of the same thing: bringing two families together in an inseparable way. The usual ideas get tired out, and couples like to come up with their own way of making their union tangible. A brilliant way to do so is by making an hourglass together. While candles are gorgeous, that flame is eventually put out. The hourglass concept provides a gorgeous, useful keepsake. This is the first symbol of your union, and picking two complementary colors will make the event even more magical. Unity candle alternatives keep guests engaged and your wedding unique. 1. The hourglass should come with instructions as to how much sand it needs to work properly. Divide that amount in half. Put that much sand of one color in one glass. The same amount of sand of the other color should be placed in the second glass. If you are not concerned with the hourglass actually measuring time, use however much sand you would like. 2. 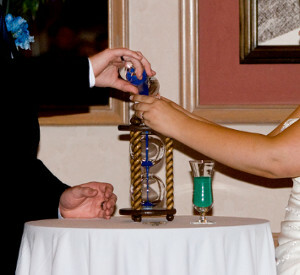 Keep the empty hourglass on a central table during the wedding ceremony. 3. When it is time for the hourglass ceremony, both the bride and groom with grab their respective sand glasses, and together pour the sand into the hourglass, forever intertwining the two colors. 4. Close the hourglass, and display it in your new home! I have seen the mixing of the two sands at wedding ceremonies before and thought it was a beautiful concept but to put it in to an hour glass I have never seen this before but I love it and it would be a beautiful keepsake for afterwards. Such a lovely idea. Where can I find a fillable hour glass, I cannot find one yet! Hi cc45Angel, If you search online for "empty hourglass," you'll find a few different websites that sell them. As mentioned, most will run about $100, but I think it's a lovely investment for a heartfelt keepsake! I also found a couple on Etsy as low as $40. Best of luck! We'd love to see pictures if you wind up doing it!